Is the pregancy glow even a real thing though? Chrissy Teigen is clearly loving #momlife—her photos with daughter Luna Simone are so precious—but it seems there's one thing she misses about her pre-baby days. The model shared a selfie on Snapchat—and because this is Teigen we're talking about, it wasn't your standard selfie. She's pouting at the camera, a small patch of red skin visible. "Goodbye pregnancy glow. 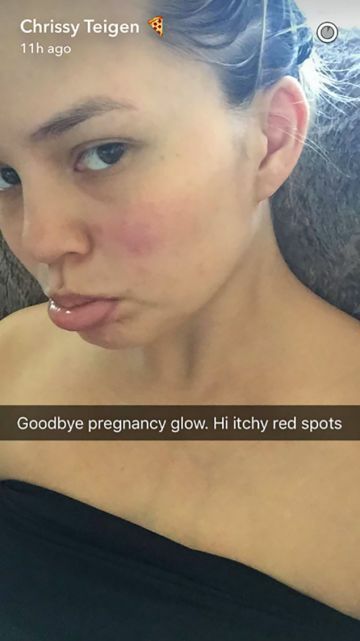 Hi itchy red spots," she captioned the photo. We think Chrissy looks great, especially considering she gave birth not even two weeks ago—and everyone knows that sleep is hard to come by in the first few weeks with a new baby. But she might be on to something: The pregnancy glow is a very real thing. According to the American Pregnancy Association, the shift in hormones can cause that makeup-free glowing effect pregnant women rave about while they're carrying. The hormones can cause your glands to produce more oil than usual, which can (if you're lucky) give you a bit of a dewy look. Pregnant bodies also produce about 50 percent more blood than normal and that increase in blood flow can give you a more vibrant, flushed look. Your skin may also react to all these internal changes by producing a bit of pregnancy acne or even a few brown patches on the skin, called chloasma, or "the pregnancy mask." The good news? Those not-so-pretty side changes generally disappear once you deliver. The bad news? That pregnancy glow tends to vanish as well once those hormones re-regulate. So yes, while Chrissy looks amazing, it's likely that she noticed a change in her skin after she gave birth. We say pregnancy glow or not, she still looks healthy, happy and as great as ever.